Eliminate wispy glue strings that mess up craft projects! Eliminate wispy glue strings that mess up craft projects! This glue creates a precise bead with the bond strength to easily adhere most craft materials. 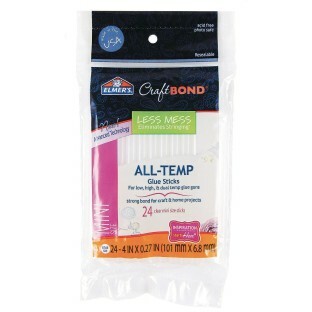 All temp formula means glue will work in any temp glue gun. Pack of 24 hot glue sticks in a zip top bag for storage. Each 4”L.